Google updated the Play Services quietly to add a couple of new security options. Smart Lock got new Trusted Places along with the existing Trusted Faces. 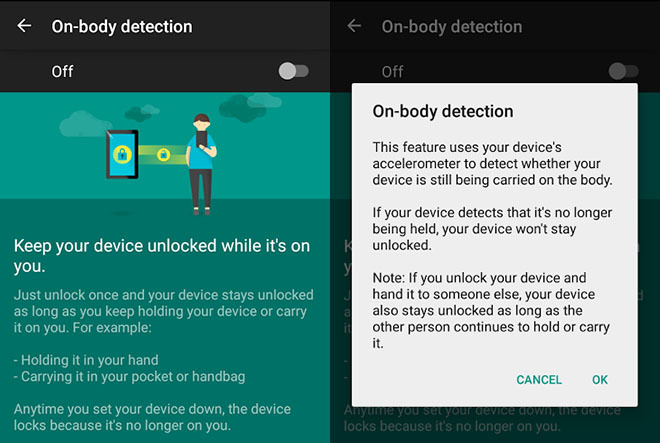 To take the Smart Lock further, Google is now rolling out an “on-body detection” feature in the Smart Lock mode. The idea is to let your phone detect its proximity to you in order to save itself and your data from being stolen. The new on-body protection feature uses the accelerometer to estimate whether you’re holding the device or it is in your pocket. This new security feature is being rolled out to the Android 5.0 and higher smartphones in stages. Also, this update will require Google Play Store 7.0.97 and higher version running on the Android 5.0 Lollipop based phone.